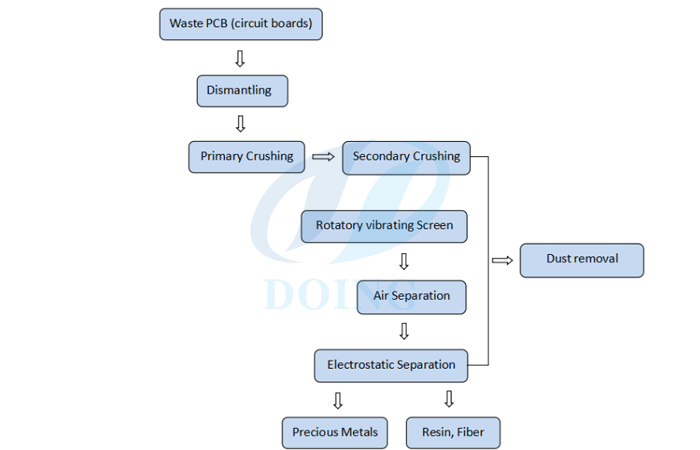 How does the PCB circuit board recycling machine works? 1. Dismantling device: To make the waste PCB boards dismantled to base boards and some elements which are not suitable for disassembling. The dismantling device equipped with dedusting system. 2. Conveyor: To convey the bas boards after dismantling to the primary crusher. 3. Primary Crusher: To crush the whole base boards into 2cm small pieces. The smaller pieces, the better, it will improve the capacity and durability of the fine crusher. 4. Loading device: To load the small pieces after primary crushing into the storage silo. 5. Storage silo: There are two advantages to collect the feeding materials into the storage silo. One is for collection without dust pollution; the other one is for evenly feeding to the fine crusher. There is a feeding device under the storage silo which can make sure the evenly feeding without blocking and crash. 6. Fine crusher: To crush the 2cm materials into fine particles, the mixture of metal and resin powder, about 16 mesh. 7. Classifying screen: To classify the mixture after fine crushing. The materials bigger than 16 mesh will go back to the storage silo for feeding into the fine crusher for fine crushing again. 8. Gravity separator: The mixture of metal and resin powder smaller than 16 mesh will go through the gravity separator to separate out most of the copper metal particles. Then there are still little fine copper metal particles left with the resin powder will directly go to the electrostatic separator for separation. 9. Electrostatic separator: After gravity separation, the resin powder with little copper metal particles will go into the electrostatic separator to separate out the left copper metal. 10. Cyclone dedusting: Before pulse dedusting, firstly collect most of the dust produced from the crushers, separators into the cyclone dust collector to alleviate the workload of the pulse dust collector. 11. Pulse dedusting: After cyclone dedusting, collect the left dust to the pulse dust collector for filtering, then let out the clean air. Prev:Why recycle waste copper wire ? 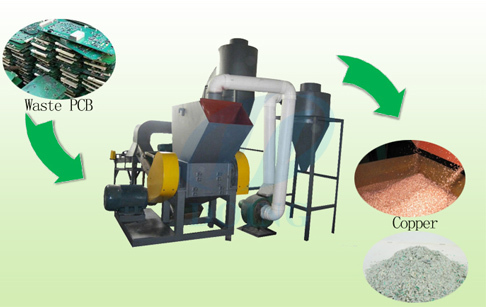 Next:What is the advantage of copper recycling machine? If you wanna to get more details about How does the PCB circuit board recycling machine works? you can send E-mail to market@doinggroup.com. You can consult our professional engineer and specialized sales team with leave a message in below form.We will contact with you ASAP.You also can visit our factory in Henan,China.Get Detailed address.